When it comes to gaming, there are constantly new companies putting out the latest and greatest tech. And–while these advancements are awesome for the evolution of gaming–they can sometimes make keeping up with new trends difficult. With so many expensive, desirable pieces of equipment to buy the cost of gaming can really begin to stack up so it’s important to make the most of the tech you do have. 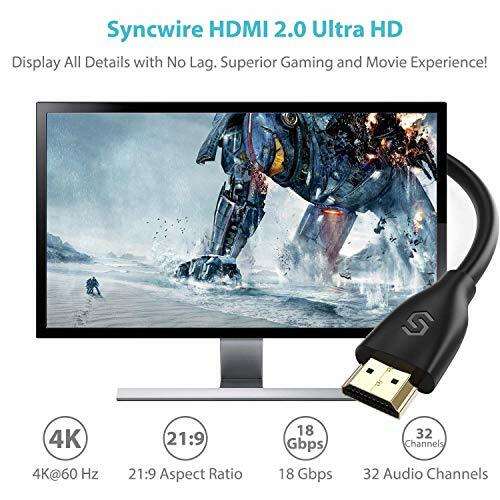 Lucky for gamers everywhere, the HDMI 2.1 specs are killer and using this simple piece of equipment can help you get the most out of your current gaming system and equipment. Here are some key components of the HDMI 3.1 specification that–after the HDMI 2.1 release date announcement back on November 28th–have been leading gaming monitors to the next level. This advanced technology can operate with any HDMI 2 adapter, and it gives support to a much greater range of refresh rates and higher video resolution. Those refresh rates operate up to 8K60 and 4K120 and flawlessly supports video resolution as high as 10k. The Ultra High-Speed cable has an incredibly low EMI (electromagnetic interference) so interruptions and interference with nearby wireless devices–such as phones and Bluetooth technology–will not get in the way of a TV or gaming experience. Additionally, eARC keeps HDMI 2.1 connectivity simple. This technology makes devices easier to use, with less hassle and an insurance of full compatibility between all the audio devices you already have and the upcoming HDMI 2.1 products, and eARC supports highly advanced audio and video quality for the best auditory and visual experience possible. For people who love gaming, this is all really great news. Because HDMI has become such a standard in the computer and gaming industry, the upgrades seen in HDMI 2.1 will enhance many aspects of gameplay and allow for a smoother gaming experience, better reaction time, and in turn, better success with the games that you love. One of the major reasons gamers will love this update is that the HDMI 2.1 refresh rate is dramatically enhanced. VRR–which stands for Variable Refresh Rate–diminishes, and sometimes even removes entirely, much of the lag that gamers experience with slower refresh rates. This means that a gamer can more easily process the images being shown on screen and there will be less blur, increasing their likelihood to pick up on subtleties and react promptly to game play. In combination with Quick Frame Transport, which reduces latency, gaming has never been so seamless. Plus, Auto Low Latency Mode on the HDMI 2.1 monitors the needs of any given game and sets the perfect latency for the specific needs, creating the smoothest viewing no matter what you choose to play.